Prove Yourself and Join the Circus! 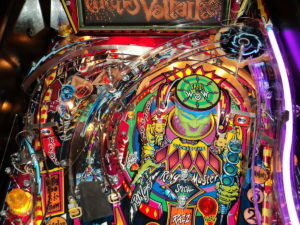 Bally’s Cirqus Voltaire is a circus-themed pinball machine released in 1997. This amazing game has plenty of great features including: two flippers, three pop bumpers, two slingshots, three stop magnets, nine standup targets, two kick-out holes, two spinning targets, speech and a playfield-mounted dot matrix display. Gameplay is smooth, fast and fun. 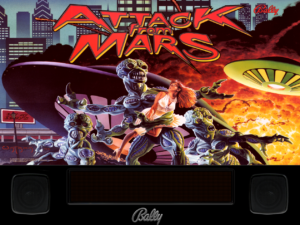 Bally utilized the circus theme to its utmost with colorful graphics, lights, music, playfield design, gameplay and backbox animation. There’s even a Ringmaster head that rises from the playfield and talks to the players. Players aim to shoot balls down the Ringmaster’s throat as he taunts them with jokes. Wizard mode is unlocked by performing different circus “marvels” in order to join the circus. Players pump up the high voltage BOOM balloon then blast it to earn points and an extra ball, and shoot the ball over the volts spot on playfield for an electrifying experience. Also, there are six different (and stackable!) multiball modes, inclduing: neon, strike-an-arc, highwire, juggler, and party. 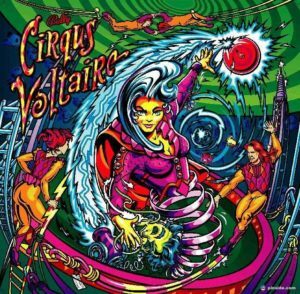 Cirqus Voltaire is a colorful, cleverly fun game with great gameplay, music, callouts and specials. 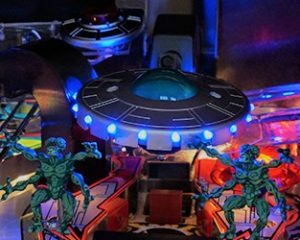 Fun facts: This is the first SS game to have a disappearing pop bumper and the only Williams pinball machine with its DMD mounted on the back of the playfield instead of in the backbox. Cirqus Voltaire is a 4-player game and has been configured for free play. Call or email for more information. Midwest Pinball is in full gear for the holiday season. We have been updating our website and adding games for sale on our inventory pages. We have many fun-to-play pinball machines to fit all holiday budgets. See below for three examples. 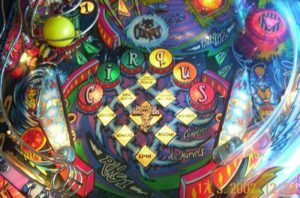 Please check out our Pinball Machines for Sale page for more great games, and as always, please call (312) 925-1386 or contact us for more information. Happy Holidays from Midwest Pinball! Bally’s 1980 Silverball Mania is a fun, 4-player game with lots of specials and a carryover feature. 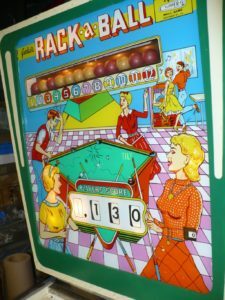 This solid state electroinc game uses its two flippers, three pop bumpers, horseshoe lane, two rolloever spots, and a kicker to challenge players into reaching for specials. Silverball’s Center Hoop feature contains 2 rollovers and a target. Going over the rollovers spots will light one or two letters in “Silverball Mania” depending upon the setting, increasing the bonus up to 5X. The center target completes the “N” in “Mania” and awards an extra ball when lit. 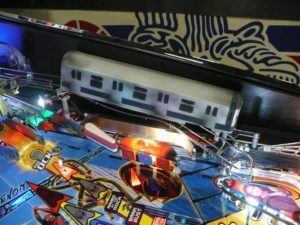 Each three times “Silverball Mania” is completed during a game, or when the kicker special is activated, one letter of “Silverball” lights on the lower left backglass. This Carryover feature is operator adjustable. The letter will remain lit from game to game, enticing players to try for its completion and an operator option award! 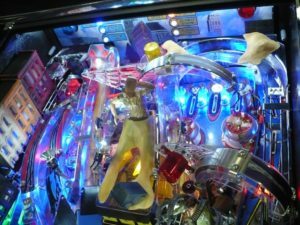 Silverball Mania grants players an extra chance to play with its Kicker feature. Beneath the flipper is a kicker that sends the ball back into play. The top center lane or the center hoop raise the kicker to activate the feature. A special is awarded if Kicker Special light is lit. Each Silverball Mania letter, when lit, is worth 1,000 points. Up to 44,000 bonus points, times the multiplier, may be collected by these letters. Completing the sequence the first time lights the Wizard Bonus, worth 15,000 points. The Supreme Wizard Bonus, worth 30,000 points, lights with the second, and the third completion awards a special and lights a letter in the backglass carryover feature. 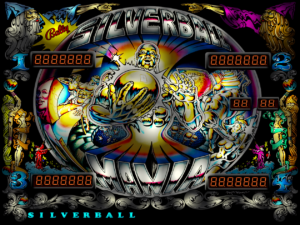 Designed by Jim Patla and boasting the unique-for-its-time artwork of Kevin O’Connor, Silverball Mania has a great Feature Programmed Sound System and has been configured for free play. 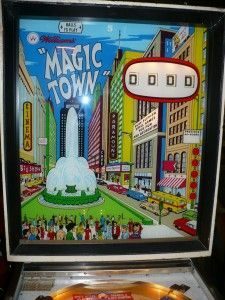 Williams’ Magic Town is a classic 1960’s pinball machine. 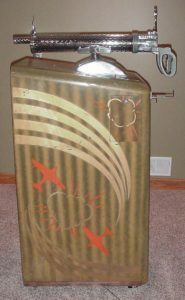 It features four pop bumpers and five stand-up targets. This is an add-a-ball game, which means that the player has opportunities to earn extra balls during play. As with many games from the early to mid 1960’s it features the nice, clean artwork of George Moletin. The backglass depicts a huge fountain in a city’s main square surrounded by skyscrapers. Pedestrians crowd the park and cars crowd the surrounding streets. Magic Town is an add-a-ball game. 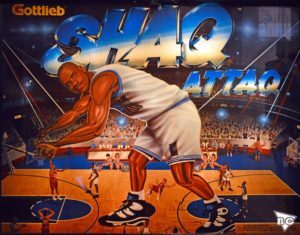 (Magic City is the replay version of this game.) Each game starts with five balls, and the player earns replays by advancing the bonus through the Special. Magic Town is a one-player game suitable for all ages and has been configured for free play. Join us at The Chicagoland™ Antique Advertising, Slot-Machine & Jukebox Show (a.k.a. Chicagoland Coin Op Show). 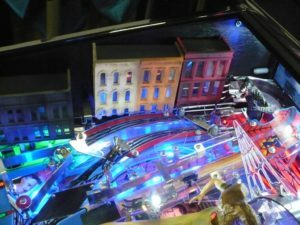 We invite you to stop by Midwest Pinball’s exhibit, talk to Rich, and see some examples of games we have for sale. We plan to bring two bring two older, electro-mechanical games, two newer games, and a 1970’s Western-themed gun game. If you would like to purchase a game and pick it up from us at the show, we can make arrangements to do that. 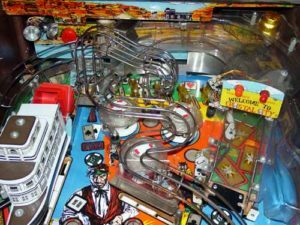 The Chicagoland Coin Op Show features coin operated collectibles such as: antique slot machines, jukeboxes, coke machines, gumball machines, penny arcade machines, music boxes, video games and our personal favorite…Pinball Machines! This is a large show with a lot to see. The show fills two exhibition halls at the Pheasant Run Resort Hotel. 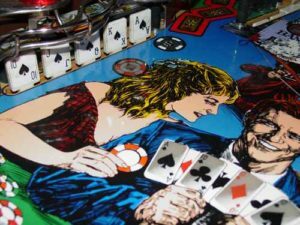 From gumball machines to pinball machines to antique collectibles, there is something to interest attendees of all ages. Vendors in the lobbies sell coffee cakes, baked goods, fudge, and jerky. Past shows have exhibited band boxes containing marionettes playing big band instruments in time with records, coin-operated scales used at general stores and butchers, and tin mutoscope machines playing short movies with a carousel of photographic cards. Last year, a vendor displayed one of the very first jukeboxes ever built. This mechanical jukebox required the user to wind it up and select from one of twenty metal cylinder records. 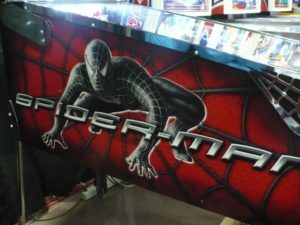 In 2007, Stern produced a limited-edition Spider-Man pinball machine featuring Spider-Man in the black costume. 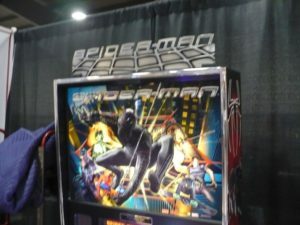 The Spider-Man Black Edition was limited to 500 units. This limited-edition game features a small plaque mounted below the backglass indicating the limited production. 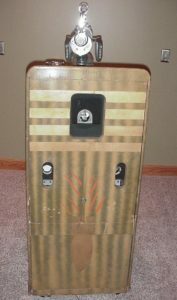 This version of the game includes special cabinet artwork, a silk-screened glass backglass with silver highlights, and a shaker motor. Spider-Man is one of the highest rated Stern games with great ball flow, a nice mix of shots, and challenging modes to be completed. Within the game, Spider-Man has three modes (challenges) for each of the four villains – Sandman, Doc Ock, Green Goblin, and Venom. 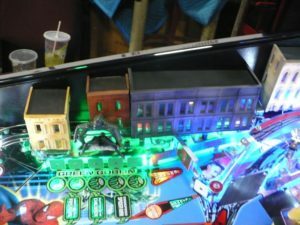 Each of the villains has his own area of the playfield and special lighting with colored LED bulbs. 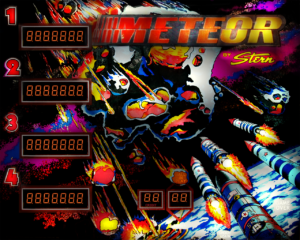 Game play includes several multi-ball modes and good animation on the dot matrix display. 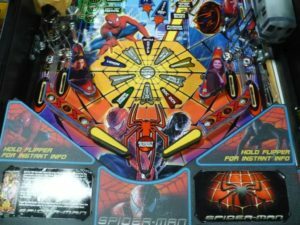 Doc Ock’s Fusion Malfunction uses a magnet in the playfield to hold the ball and release it or challenge the player to knock the ball loose for a two-ball multi-ball. Sandman hides behind a motorized bank of three targets that need to be hit to lower the bank and allow access to targets and the Sandman himself. Unlike the backglass in most modern games, which are plastic, this edition of Spider-Man features a silk-screened glass with silver highlights that enhance the black Spider-Man suit. This is a home-use-only (HUO) game being sold by the original owner. It is in excellent shape with no fade on the cabinet nor any scratches or dings. 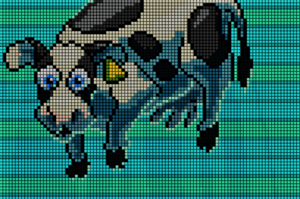 In addition, several additional modifications (mods) have been added to this game. The first is a brushed aluminum topper that can be flipped down if needed. Also, a model cityscape and elevated train (from Back Alley Creations) have been added along the sides above the ramps and wireforms. These are backlit to provide more depth, while not affecting game play. The game has also been updated with LED bulbs throughout for better color and less maintenance. 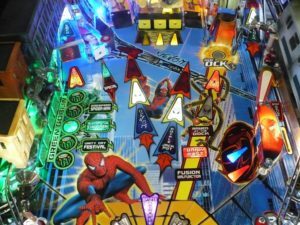 Spider-Man is a four-player game suitable for all ages. The game has been configured for free play and can also be switched from English to Spanish instructions. 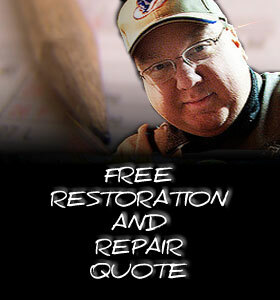 We offer local delivery and installation services or we can arrange shipping within the US. Please call or e-mail us with any questions or for more photos.